Well my geese went together easily and speedily, I did not have to make them twice. I used the Fit to be Geese ruler by Monique Dillard for Open Gate Quilts for my geese. They are made bigger then trimmed to size, perfect every time. When I put all the geese on my design wall the pink geese really stood out to me. I like pink but wasn't in the mood for that much pink, so I replaced a few. There's still pink, just not as much. I'm liking how this is shaping up! 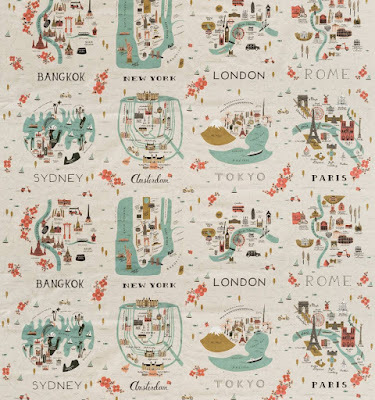 Vicky, the LA Quilter has started her Due South but has yet to update her blog. Hopefully she'll do that soon, hint, hint. She's going with French General, a great choice, I think it will make a beautiful Due South. 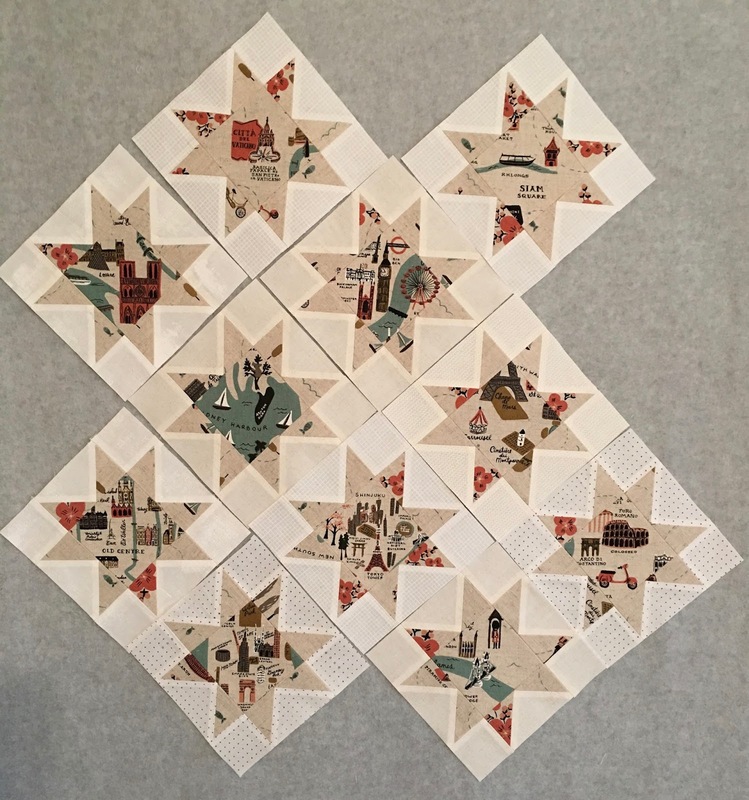 I've gotten a few requests for information regarding the raffle for my Hometown USA quilt. Well the raffle has officially started. The quilt is currently on display at the Mt. Carmel Illinois Public Library. Here I am with the quilt and the library foundation board president, Donnie Price, also know as Thelma's brother. Not really, that's the family joke, when I come to town I'm known as Don Price's sister, but that's OK, I couldn't ask for a better baby brother. Plus he's lived in my hometown almost all his life, I left 40 years ago. Connie Lancaster at Quilts Plus in Indianapolis, IN did the custom quilting. Tickets are on sale at the library, by library and foundation board members, and me. The tickets are $5 per ticket or 5 for $20. The drawing will be held on June 10, 2017. If you're interested in purchasing a ticket drop me an email and I'll get with you on further details. When not working on Due South I've been thinking about my other Year of Thelma 2017 Quilting Goals. 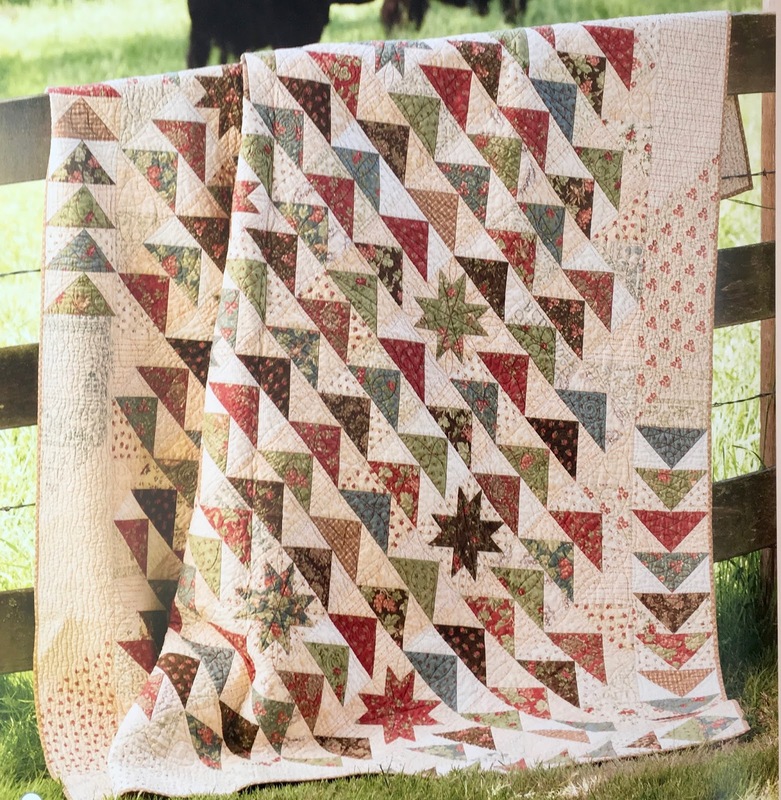 Piecing a red and white quilt is on that list. 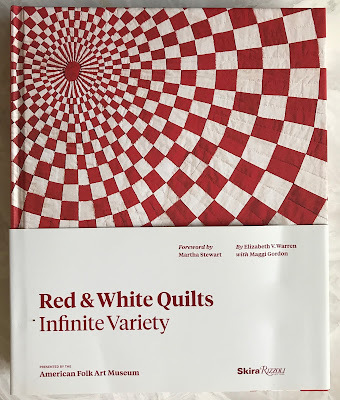 I've been spending my evenings admiring all the quilts in this book. My new problem is trying to narrow down my favorite to just one pattern. 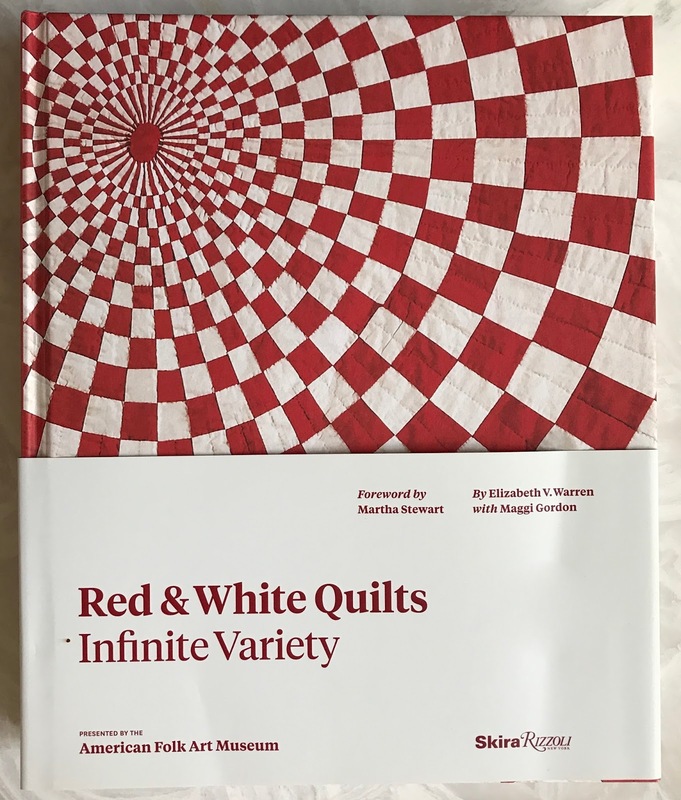 I may have to start piecing a red a white quilt every year for the next 10 years. The thing about a red and white quilt, they never go out of style. 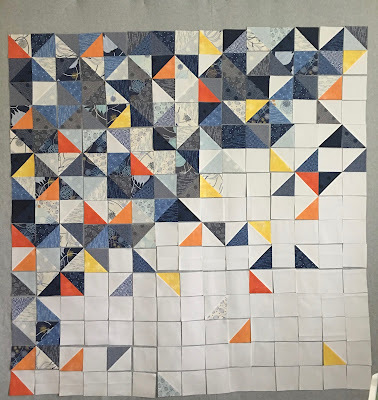 So I've started on Due South, by Carrie Nelson for Miss Rosie's Quilt Co, a pattern that's been on my to-do list for years, literally, years. This is Carrie's Due South, mine will be very similar, except for that noticeably scrappy background, that's just not me. My background will be scrappy but unnoticeable. I think one of the things I've always liked about this pattern is the movement of the geese. I also like the name, Due South, like these geese have some place to go, sort of a traveling theme. 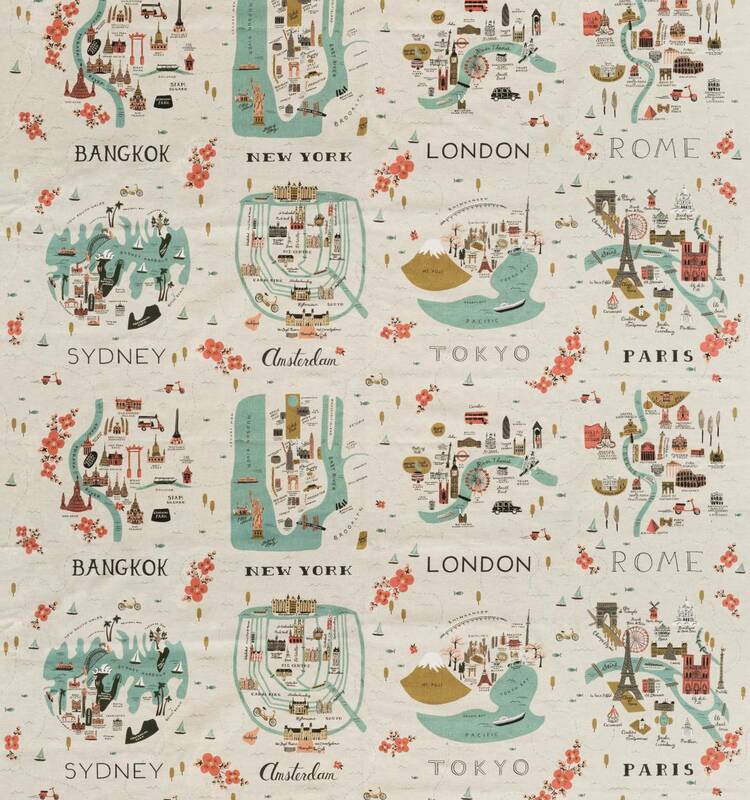 Rifle Paper Co has produced this canvas fabric that has a nice travel theme. I'm sure it's supposed to be for bags and pillows, but I decided to chop it up for my Due South, to keep with that travel feel and theme. I decided to start with the stars, I only needed 11. So I fussy cut my center and points, made my inspiration/ test block, declared it a success and proceeded to piece the rest of the blocks. TA DA! What a glorious start. Not such a glorious start, but I love them all the same. I like the heavy look and feel of the canvas and hope it makes the stars pop when set against the cotton geese, 212 geese. Gee I hope I don't have to make them all twice. Don't forget, we're celebrating "The Year of Thelma" by everyone piecing a Miss Rosie's Quilt Co quilt pattern with me, ending with a parade in December to wrap up my year, I hope you join in. 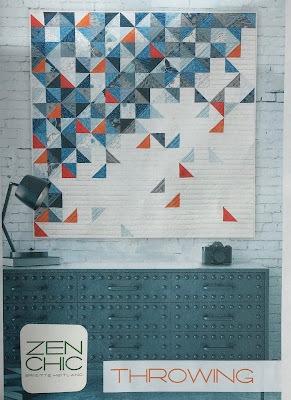 When I saw a picture of the quilt Throwing by Zen Chic, I immediately bought the pattern and started searching online for some True Blue fabric. 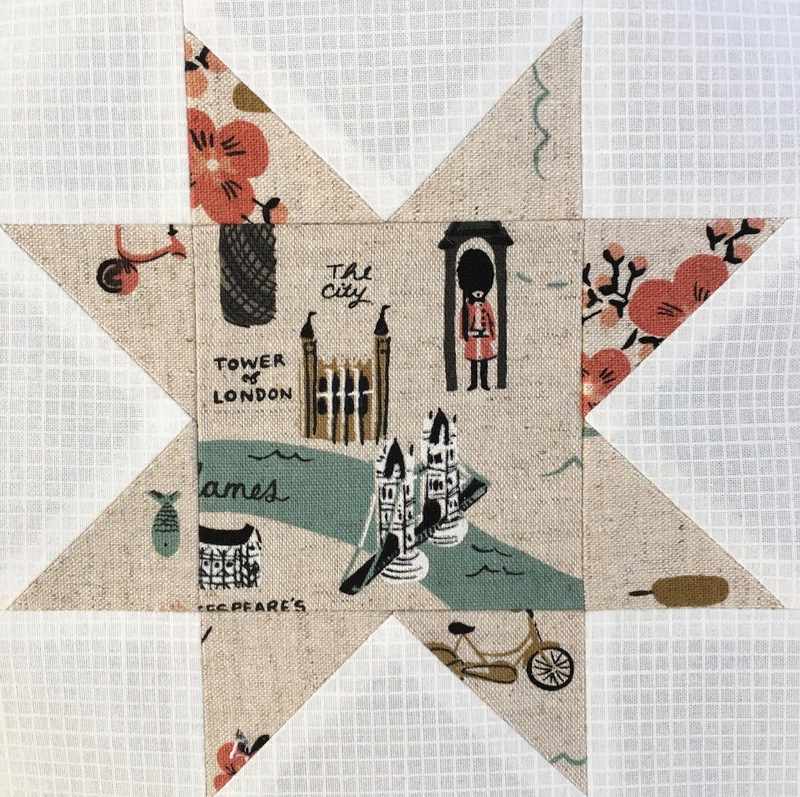 The pattern calls for 3 True Blue charm packs by Zen Chic for Moda, but I bought a layer cake on Etsy for less than the cost of 3 charm packs, which gave me extra hsts to play with. The designer added a red and orange Grunge print to the mix. I used two different shades of orange and one yellow Grunge to my Throwing. This was my first attempt. 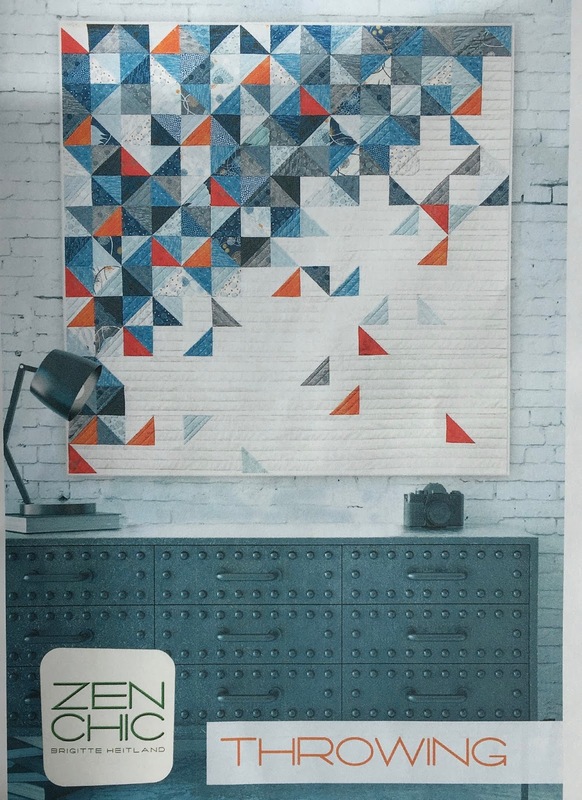 The quilt on the pattern cover and the design sheet inside the pattern are different. The cover quilt used more of the medium blues from the family of fabric, my final version is somewhere in between the two. And while I did fuss a little with the placement of each block, not really that much more than I do on any of my projects, I'm just a fussy quilter. This is my final version. It finished at 61" x 61"
I has approximately 374 pieces. Now that quilt 199 is done I can start on quilt number 200, Due South. First Step, prepping the fabric. I usually don't get to sew on the weekends, but am looking forward to getting started on this project the first of next week. 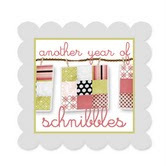 Are you ready to start on your Miss Rosie's Quilt Co project and sew along with me? 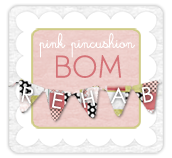 Kristen has finished all her Cracked Pots houses, be sure to follow her progress on the blog Meadowbrook in my Blogs List.